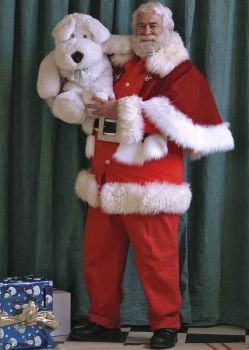 Franz Brown models as Santa for an Oregon artist. “Christmas Heartbeat” by Franz Brown is part of his “Prairie Christmas” series. Kids in Hot Springs call Franz Brown “Santa” all year round, whether he’s dressed in red or not. His jolly smile and naturally white whiskers are distinctive in all four seasons. 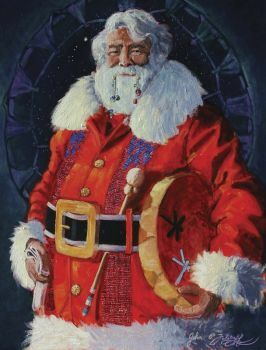 Brown has modeled as Santa for Oregon artist Tom Browning for many years. They met through Brown’s work as a writer and photographer at Southwest Art magazine. His image appears on plates, shopping bags, cards, pillows, cookie tins and prints that end up around the world. Browning photographs Brown in various situations and then creates paintings from the images. Brown is also an artist, and started painting seriously when he relocated to Hot Springs in 2003. He began painting Santa himself after someone asked why Browning never created a prairie Santa. Browning was more interested in East or West Coast themes, so Brown set up a camera and photographed himself to begin a series of his own paintings relating Santa to the prairie. “I think Santa has a special connection to the Lakota because generosity is a highly esteemed value of the Lakota,” Brown says. Besides looking the part, Brown also revels in the Christmas spirit. “I’ve always enjoyed Christmas. It’s always a special time,” he says. One theme in his Santa paintings is that gift giving doesn’t have to be material. “Giving comfort, love or companionship can be gifts, too,” Brown says. Editor’s Note: This story is revised from the November/December 2008 issue of South Dakota Magazine. To order a copy or to subscribe, call 800-456-5117. I love this article! Franz is a great family friend, one I have not seen in many years. I will always remember my grandma making those Santa suits for him. And I love him for taking my senior pictures! I am so grateful for his prairie series and love seeing him in so many different scenes. Mom and I still look specifically for photos of Franz during the holiday season! Miss you much, Franz! My wife Judy and I recently relocated from Custer, SD, to New Braunfels, TX, where, low and behold, we met another Santa, Phil Cayton and his wife Lynda (Mrs. Clause.) I dare say “another” because our first, not withstanding our childhood parents, was Santa Franz Brown of Hot Springs. Like Franz, Lone Star Phil and Mrs. Santa live the spirit of the winter holiday season all year long. I texted Santa Phil your Nov/Dec 2008 story, “Hot Springs Santa” and he answered, “🎅Good lookin’ Santa!” Hum, seems to me ,,that Santa’s belong to a mutual admiration society..
Y’all take care now, ya heeer?! 453 N. Bus. IH 35, New Braunfels, TX 78130.